(Williamsburg, VA) – The College of William and Mary announced today that Joseph J. Plumeri—alumnus (1966), member of the Board of Visitors, and longtime supporter—has committed $2 million to establish the Plumeri Awards for Faculty Excellence. "It is a privilege for me to give back to honor and support our faculty's efforts," said Plumeri. "The faculty is the DNA of the College and each day they work passionately to challenge the minds of our exceptional students. Their research and other pursuits extend well beyond the campus." With an annual payout of $200,000 over 10 years, the Plumeri Awards will provide 20 members of the faculty with $10,000 for research opportunities, summer salaries or other stipends associated with scholarly endeavor. "This extraordinary gift from Joe Plumeri will make a real difference for the better at William and Mary," said Interim President W. Taylor Reveley III. "We are grateful for his commitment to the faculty." Candidates for the Plumeri Awards will be nominated by the deans of their respective schools, with the final decision made by Provost P. Geoffrey Feiss. The first awards will be announced and presented during the 2009-2010 academic year and will continue each year for 10 years. "This is a tremendous demonstration of support for the College and most particularly for its faculty," said Feiss. "Mr. Plumeri's unyielding loyalty and generosity to his alma mater will create opportunities for our faculty to extend their preeminence in teaching and research—and thus enhancing the experience of every William and Mary student—and we are incredibly grateful for his generosity and passionate devotion to the practice of great teaching and mentoring." Plumeri has long been a generous supporter of the College, including support of Gateway William and Mary, a program that provides supplemental assistance to Virginians when other financial aid falls short. In addition, he has established a scholarship and other endowments in the Mason School of Business; provided funds to build Plumeri Park, the College's baseball stadium; created the Plumeri House, a guest residence for visitors to campus; endowed scholarships for student-athletes; and established the Plumeri Pro-Am, a golf tournament that annually raises thousands of dollars for the College's athletics program. 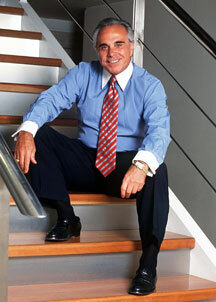 Plumeri is chairman and CEO of the Willis Group. With headquarters in London and New York, the Willis Group is recognized as a leading global insurance broker, handling risk management and reinsurance across a wide range of service areas and industries..
"Joe Plumeri is a devoted servant-leader and a true ambassador of the College of William and Mary," said Rector Michael K. Powell. "Through his generosity, he is enhancing the landscape of the College as a premier institution of higher learning for both our faculty and our students."